Designed by architect Moshe Safdie, the 285,000-square-foot Kauffman Center includes two standalone performance halls, both housed within a dramatic overarching shell featuring a glass roof and glass walls that provide sweeping views of Kansas City. The Muriel Kauffman Theatre is an 1,800-seat venue designed to be visually striking, yet retain an intimate experience for both audiences and performers. The Muriel Kauffman Theatre hosts dance performances, plays, musicals and more, and serves as the performance home of Kansas City Ballet and Lyric Opera of Kansas City. The 1,800-seat venue is designed to be visually striking, yet retain an intimate experience for both audiences and performers. Inspired by the great opera houses of Europe, audiences are seated in front of the stage in a variation on the traditional horseshoe configuration—bringing them closer to the performers than in traditional auditorium-style venues. 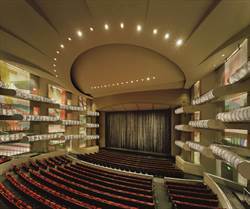 The design of the Muriel Kauffman Theatre’s expanded facilities provides dramatically enhanced performance capabilities—including a vast 5,000-square-foot stage; a flexible orchestra pit that can accommodate 95 musicians; increased backstage facilities; a 74-foot tall fly tower; and a flexible proscenium stage opening. The Theatre’s fly tower allows for scenery as tall as 30 feet to be flown above the stage, allowing productions to make use of more sophisticated scenic design elements. The stage’s flexible proscenium opening allows the width and height of the stage to be adjusted, making it tremendously adaptable and allowing for both intimate and larger-scale productions. The Theatre also offers the Figaro seatback system, with a personal monitor mounted on each seat for productions requiring translation. The distance from the stage to Helzberg Hall’s farthest seat is just over 100 feet. This creates an immersive experience for the audience. From chamber music to full orchestra, from jazz and pop to lectures and recitals, Helzberg Hall is the performance home of the Kansas City Symphony as well as host of the best and brightest international soloists and ensembles. Named in recognition of a $10-million gift from Shirley B. and Barnett C. Helzberg, the 1,600-seat venue is oval in shape, with a vineyard-style seating configuration. The stage extends approximately one-third of the distance into the Hall, thus placing 40 percent of the seats alongside or behind the orchestra. This creates an intimate and immersive experience for both artists and audiences and allows a portion of the audience to experience the musician’s perspective during performance. The distance from the stage to Helzberg Hall’s farthest seat is just over 100 feet. The Hall features mechanical risers that allow the layout of the stage to be altered quickly and easily, greatly expanded backstage facilities, and acoustics which can be readily customized for solo concerts, chamber music, and full orchestra. 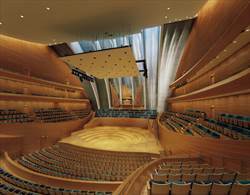 Helzberg Hall also enables the Kansas City Symphony to rehearse and perform in the same space, something it was unable to do previously. The visual centerpiece of Helzberg Hall is a Casavant Frères pipe organ, which is one of the finest concert hall organs in the country. Quebec-based firm Casavant Frères custom-designed the mechanical organ in the French romantic tradition, with 79 stops, 102 ranks, and 5,548 pipes.